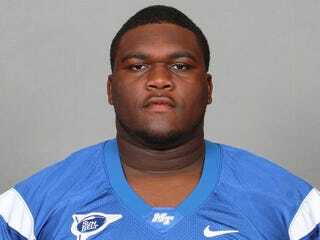 Middle Tennessee State defensive tackle J.D. Jones choked his girlfriend as teammates watched and filmed it, according to The Daily News Journal's story on a report from the school's police department. Jones was arrested on two counts of domestic aggravated assault last week, and he and two fellow Blue Raiders—cornerback Rodney O'Neal and defensive tackle Marcus Robinson, each arrested on charges of criminal responsibility for conduct of others—have been suspended from the team. Jones' ex-girlfriend, Middle Tennessee student Ronni Cantrell, alleges incidents of abuse that took place from October 2012 to May 2013, including Jones putting her in a headlock and hitting her with "a pink baseball-type bat" on the legs and back until she gave him money to buy marijuana, and Jones throwing a football and hitting her in the face. Cantrell is 5'3" and 115 pounds, and Jones was listed at 6'2" and 322 pounds in Middle Tennessee's 2013 spring football prospectus. "We will react accordingly after gathering all pertinent information," Middle Tennessee coach Rick Stockstill said in a statement announcing the players' suspension last week. Handling this situation might trump telling his players they weren't going to a bowl last year as "the hardest thing" Stockstill has "had to do as a coach."